In response to high customer demand in Puerto Rico, Crowley Fuels has acquired 40 additional ISO tanks for its Caribbean group that will be used to supply, transport and distribute U.S.-sourced liquefied natural gas (LNG) to customers on the island. The addition of these tanks brings Crowley’s total equipment fleet to 75 cryogenic ISO tank containers, giving the company the capacity to ship over 20 million gallons of LNG annually to customers via a world-class logistics supply chain. The new 40-foot tanks feature technological improvements that increase the offload rate, allowing for faster fuel transfers to customers. “Adding new ISO tanks to our equipment fleet not only allows us to meet heightened customer demand in Puerto Rico, but also to continue to deliver an uninterrupted supply of LNG to the Caribbean,” said Crowley Vice President Greg Buffington. 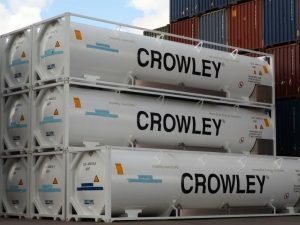 The latest addition of LNG ISO containers to the Crowley fleet will ensure greater supply chain inventory security when coupled with the 520,000 gallons per day of liquification ability and 98 million gallons of LNG storage capacity from Crowley’s partners in Florida, Georgia and Alabama. Additional storage capacity in Puerto Rico is under development. The LNG supply chain will be further enhanced when Crowley deploys its new LNG-powered combination container/roll-on roll-off (ConRo) ships, which will provide faster transit to Puerto Rico, reducing the turn time of ISO tanks to customers. From LNG sourcing and logistics transportation, Crowley makes the entire LNG supply chain seamless for customers and provides energy resiliency. The company’s transportation from U.S. liquefaction facilities to customers’ storage units is managed by its domestic logistics team, which coordinates over-the-road transportation to shipping terminals in Jacksonville or Port Everglades, Fla. Once at the terminal, the containers are loaded onto company-owned vessels and transported to customers’ locales. At the port of entry, Crowley’s on-site logistics team delivers the LNG to customers’ facilities, where it is re-gasified into pipeline natural gas for power generation. Crowley Fuels to-date has delivered over seven million gallons of LNG to industrial customers in Puerto Rico, including food and beverage manufacturers, pharmaceutical companies and more.